The Sound sensor ML78f consists of a microphone connected via a microphone plug to the sensor box with an amplifier. The microphone has a frequency response between 20 and 20,000 Hz. The sensor is suited to measure and display sound waveforms. It also works well for speed of sound experiments. The best sources to use with the sound sensor are tuning forks and musical instruments. You may also investigate a human voice or a whistle. • Measuring sound waveforms of different sound sources: tuning forks, various musical instruments, and a variety of human voice sounds. • Determining the speed of sound through air and other materials. • Determining formants of the recorded speech waveforms by using sound signal analysis tools (e.g. Fast Fourier Transform or Liner Prediction). The Sound sensor ML78f is a digital sensor (on-sensor digital conversion), which gives calibrated values of the measured quantity. 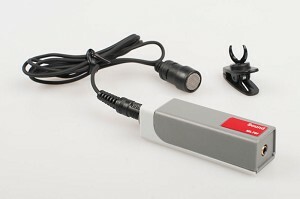 This sensor can only be connected to the CMA MoLab interface and not to other CMA interfaces such as VinciLab, CoachLab II+ or EuroLab.